I’m not quite ready to trade places with Canada, but it may just be a matter of time. Like Germany and Sweden, they seem to be slowly but surely trying to move in the right direction. I’ve already commented on good Canadian fiscal policy (including a much-needed lesson for Paul Krugman), and I’ve also praised our northern neighbors for privatizing their air traffic control system and opposing global bank taxes. But I’ve just been skating along the surface. My Cato colleague Chris Edwards (a Canadian transplant) has just written up a report with some of the key details. Two decades ago Canada suffered a deep recession and teetered on the brink of a debt crisis caused by rising government spending. The Wall Street Journalsaid that growing debt was making Canada an “honorary member of the third world” with the “northern peso” as its currency. But Canada reversed course and cut spending, balanced its budget, and enacted various pro-market reforms. The economy boomed, unemployment plunged, and the formerly weak Canadian dollar soared to reach parity with the U.S. dollar. …[In] the early 1990s combined federal, provincial, and local spending peaked at more than half of gross domestic product (GDP). In the 1993 elections, Prime Minister Jean Chretien’s Liberals gained power promising fiscal restraint, but this was the party of Trudeau, and so major reforms seemed unlikely. In the first Liberal budget in 1994, Finance Minister Paul Martin provided some modest spending restraint. But in his second budget in 1995, he began serious cutting. In just two years, total noninterest spending fell by 10 percent, which would be like the U.S. Congress chopping $340 billion from this year’s noninterest federal spending of $3.4 trillion. When U.S. policymakers talk about “cutting” spending, they usually mean reducing spending growth rates, but the Canadians actually spent less when they reformed their budget in the 1990s. The Canadian government cut defense, unemployment insurance, transportation, business subsidies, aid to provincial governments, and many other items. After the first two years of cuts, the government held spending growth to about 2 percent for the next three years. With this restraint, federal spending as a share of GDP plunged from 22 percent in 1995 to 17 percent by 2000. The spending share kept falling during the 2000s to reach 15 percent by 2006, which was the lowest level since the 1940s. …The spending reforms of the 1990s allowed the Canadian federal government to balance its budget every year between 1998 and 2008. The government’s debt plunged from 68 percent of GDP in 1995 to just 34 percent today. 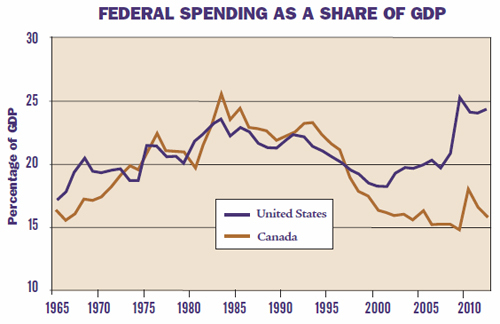 Total government spending, including sub-national units such as states and provinces, is still slightly higher in Canada than in the United States. But I suspect that will change within the next five years. Not surprisingly, good spending policy leads to good tax policy, as Chris explains. a slimmed-down Canadian government under the Liberals enjoyed large budget surpluses and pursued an array of tax cuts. The Conservatives continued cutting after they assumed power in 2006. During the 2000s the top capital gains tax rate was cut to 14.5 percent, special “capital taxes” on businesses were mainly abolished, income taxes were trimmed, and income tax brackets were fully indexed for inflation. Another reform was the creation of Tax-Free Savings Accounts, which are like Roth IRAs in the United States, except more flexible. The most dramatic cuts were to corporate taxes. The federal corporate tax rate was cut from 29 percent in 2000 to 15 percent in 2012. Most provinces also trimmed their corporate taxes, so that the overall average rate in Canada is just 27 percent today. By contrast, the average U.S. federal-state rate is 40 percent. …Canada’s federal corporate tax rate has been cut from 38 percent in the early 1980s to just 15 percent today. Despite the much lower rate, tax revenues have not declined. Indeed, corporate tax revenues averaged 2.1 percent of GDP during the 1980s and a slightly higher 2.3 percent during the 2000s. The Laffer Curve effect of higher tax revenue shouldn’t be surprising, though American policymakers still operate in a fantasy world where taxes are assumed to have no impact on the economy and no impact on taxable income. But that’s a secondary point. The main lesson of this research by Chris is that it is both possible and desirable to shrink the burden of government spending. And it’s not just Canada that has done the right thing. This video outlines past reforms in Ireland, Slovakia, and New Zealand as well. P.S. Other than the cold weather, another reason why I don’t quite yet want to trade places with Canada is the government-run healthcare system. Right now, high-ranking politicians from the frozen wastelands can escape to America when they fall ill. If we copy Canada (and we’re already pretty far down that path), then where will we be able to go to get high-quality and cutting-edge care? P.P.S. The Canadians aren’t know for having a sense of humor, but the person who wrote this parody about emigrating American leftists definitely has a good sense of humor. In a post last week, I explained that Obama has been a big spender, but noted his profligacy is disguised because TARP outlays caused a spike in spending during Bush’s last fiscal year (FY2009, which began October 1, 2008). Meanwhile, repayments from banks in subsequent years count as “negative spending,” further hiding the underlying trend in outlays. When you strip away those one-time factors, it turns out that Obama has allowed domestic spending to increase at the fastest rate since Richard Nixon. I then did another post yesterday, where I looked at total spending (other than interest payments and bailout costs) and showed that Obama has presided over the biggest spending increases since Lyndon Johnson. Looking at the charts, it’s also rather obvious that party labels don’t mean much. 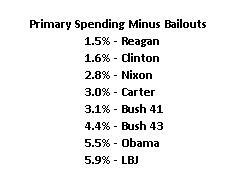 Bill Clinton presided during a period of spending restraint, while every Republican other than Reagan has a dismal track record. President George W. Bush, for instance, scores below both Clinton and Jimmy Carter, regardless of whether defense outlays are included in the calculations. That’s not a fiscally conservative record, even if you’re grading on a generous curve. This leads Jonah Goldberg to offer some sage advice to the GOP. Here’s a simple suggestion for Mitt Romney: Admit that the Democrats have a point. Right before the Memorial Day weekend, Washington was consumed by a debate over how much Barack Obama has spent as president, and it looks like it’s picking up again. …all of these numbers are a sideshow: Republicans in Washington helped create the problem, and Romney should concede the point. Focused on fighting a war, Bush — never a tightwad to begin with — handed the keys to the Treasury to Tom DeLay and Denny Hastert, and they spent enough money to burn a wet mule. On Bush’s watch, education spending more than doubled, the government enacted the biggest expansion in entitlements since the Great Society (Medicare Part D), and we created a vast new government agency (the Department of Homeland Security). …Nearly every problem with spending and debt associated with the Bush years was made far worse under Obama. The man campaigned as an outsider who was going to change course before we went over a fiscal cliff. Instead, when he got behind the wheel, as it were, he hit the gas instead of the brakes — and yet has the temerity to claim that all of the forward momentum is Bush’s fault. 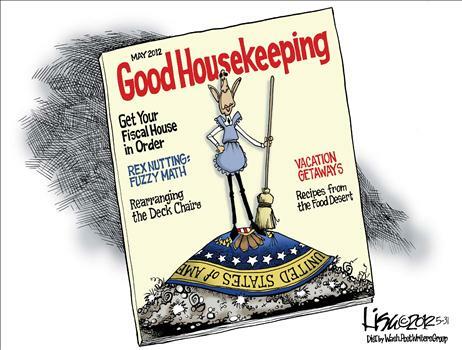 …Romney is under no obligation to defend the Republican performance during the Bush years. Indeed, if he’s serious about fixing what’s wrong with Washington, he has an obligation not to defend it. This is an argument that the Tea Party — which famously dealt Obama’s party a shellacking in 2010 — and independents alike are entirely open to. Voters don’t want a president to rein in runaway Democratic spending; they want one to rein in runaway Washington spending. Jonah’s point about “fixing what’s wrong with Washington” is not a throwaway line. Romney has pledged to voters that he won’t raise taxes. 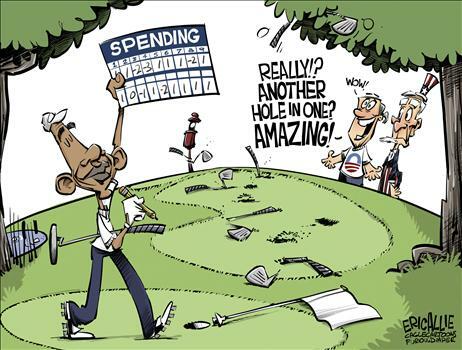 He also has promised to bring the burden of federal spending down to 20 percent of GDP by the end of a first term. But even those modest commitments will be difficult to achieve if he isn’t willing to gain credibility with the American people by admitting that Republicans helped create the fiscal mess in Washington. Especially since today’s GOP leaders in the House and Senate were all in office last decade and voted for Bush’s wasteful spending. It actually doesn’t even take much to move fiscal policy in the right direction. All that’s required is to restrain spending so that is grows more slowly than the private sector (with the kind of humility you only find in Washington, I call this “Mitchell’s Golden Rule“). The entitlement reforms in the Ryan budget would be a good start, along with some much-needed pruning of discretionary spending. And if you address the underlying problem by limiting spending growth to about 2 percent annually, you can balance the budget in about 10 years. No need for higher taxes, notwithstanding the rhetoric of the fiscal frauds in Washington who salivate at the thought of another failed 1990s-style tax hike deal. The fiscal nightmare in Europe should be all the proof that’s needed about the dangers of wasteful spending and punitive tax rates. Unfortunately, if his proposals for bigger government and class-warfare tax policy are any indication, President Obama still seems to think those policies would be good for America. American states also are a laboratory, showing that states with better tax policy create more jobs and grow much faster. And many state policy makers have learned the right lesson. Here’s some of what the Wall Street Journal said in an editorial this morning. Last week Governor Sam Brownback continued the post-2010 reform trend among GOP Governors by signing the biggest tax cut in Kansas history. The plan chops the state income tax rate to 4.9% from 6.45% and eliminates income taxes on about 190,000 Kansas small businesses. …Mr. Brownback says the income tax cut will put Kansas “on a road to faster growth.” Although no one in Europe or the White House agrees with the philosophy, tax-cut initiatives have been spreading in the states. Already this year Tennessee has eliminated its gift and estate tax, Arizona has cut its capital gains tax (to 3.4% from 4.54%), and Idaho and Nebraska have cut income tax rates. Oklahoma is expected to cut tax rates. The tax cutting Governors all say they hope to be more like no-income-tax Texas, which has far outpaced other states in job creation. Sadly, the folks in the White House aren’t hopping on the tax cut bandwagon. Instead, they want America to be more like the President’s home state of Illinois, a fiscal basket case. But it’s not just Illinois that’s in trouble because of a bloated and expensive public sector. It turns out that millions of Americans are voting with their feet to escape states with excessive taxes. Here are some passages from a CNS report on some fascinating data from the Tax Foundation. New York State accounted for the biggest migration exodus of any state in the nation between 2000 and 2010, with 3.4 million residents leaving over that period, according to the Tax Foundation. Over that decade the state gained 2.1 million, so net migration amounted to 1.3 million, representing a loss of $45.6 billion in income. Where are they escaping to? The Tax Foundation found that more than 600,000 New York residents moved to Florida over the decade – opting perhaps for the Sunshine State’s more lenient tax system – taking nearly $20 billion in adjusted gross income with them. Over that same time period, 208,794 Pennsylvanians moved to Florida, taking $8 billion in income. …California is also known for more onerous taxes and regulations, and the foundation shows similar trends of migration from there to other states like Texas and Arizona. The Tax Foundation ranked the Golden State sixth highest in the nation for state and local tax burden in 2009. Between 2000 and 2010, the most recent data available, 551,914 people left California for Texas, taking $14.3 billion in income. Texas has no state income tax or estate tax. …Another 28,088 from California relocated to Nevada and 30,663 to Arizona, a loss of $699.1 million and $707.8 million in income respectively. While these are remarkable numbers, they shouldn’t be a surprise. I’ve written about the failures of New York and California, and I’ve also commented on the success of Texas. And for those who prefer international evidence, I’ve cited the differences between successful low-tax jurisdictions such as Hong Kong and Singapore and decrepit high-tax nations such as France. This doesn’t mean that fiscal policy is a silver bullet. There are reasonably successful nations with big governments, but they compensate with ultra-free markets in other areas. And there are also low-tax nations that languish because of mistakes such as excessive regulation and failure to protect property rights. But all other things being equal, big government and high tax rates are a recipe for decline. Yet that’s the only item on the White House menu. P.S. If you think people should have the right to lower their tax burdens by moving from California to Nevada, shouldn’t they also have the right to do the same thing by moving from the United States to Singapore? Last week, I jumped into the surreal debate about whether Obama has been the most fiscally conservative president in recent history. I sliced the historical data from the Office of Management and Budget a couple of ways, showing that overall spending has grown at a relatively slow rate during the Obama years. Adjusted for inflation, both total spending and primary spending (total spending minus interest payments) have been restrained. So does this make Obama a fiscal conservative? And how can these numbers make sense when the President saddled the nation with the faux stimulus and Obamacare? Good questions. It turns out that Obama supposed frugality is largely the result of how TARP is measured in the federal budget. To put it simply, TARP pushed spending up in Bush’s final fiscal year (FY2009, which began October 1, 2008) and then repayments from the banks (which count as “negative spending”) artificially reduced spending in subsequent years. The combination of those two factors made a big difference in the numbers. Here’s another table from my prior post, looking at how the presidents rank when you subtract both defense and the fiscal impact of deposit insurance and TARP. All of a sudden, Obama drops down to the second-to-last position, sandwiched between two of the worst presidents in American history. Not exactly a ringing endorsement. But this ranking is incomplete. At that point, I was trying to gauge Obama’s record on domestic spending, and the numbers certainly provide some evidence that he is a stereotypical big-spending liberal. But the main debate is about which president was the biggest overall spender. So I’ve run through the numbers again, and here’s a new table looking at the rankings based on average annual changes in inflation-adjusted primary spending, minus the distorting impact of deposit insurance and TARP. Obama is still in the second-to-last position, but spending is increasing by “only” 5.5 percent per year rather than 7.0 percent annually. 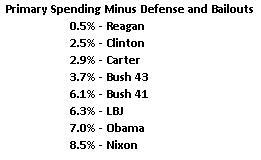 This is obviously because defense spending is not growing as fast as domestic spending. Reagan remains in first place, though his score drops now that his defense buildup is part of the calculations. Clinton, conversely, stays in second place but his score jumps because he benefited from the peace dividend after Reagan’s policies led to the collapse of the Soviet Empire. Let’s now look at these numbers from a policy perspective. Rahn Curve research shows that government is far too big today, so the goal of fiscal policy should be to restrain the burden of government spending relative to economic output. This means that policy moves in the right direction when government grows more slowly than the private sector, as it did under Reagan and Clinton. But if government spending is growing faster than the productive sector of the economy, as has been the case during the Bush-Obama years, then a nation eventually will become Greece. I suppose I could draw some sort of policy message from this video, perhaps by comparing the effectiveness of private sector charity with the blundering incompetence of government. And here’s another video on the same general topic. I remember being at Reagan Airport when one of the honor flights landed. It was very moving to see everyone in the terminal cheer as the veterans came off the plane. That’s true patriotism. Unlike clowns such as Joe Biden who think higher taxes are patriotic. P.S. Watch this Penn and Teller video if you want a good message about patriotism.